The Gulf economies of the Middle East are forming partnerships with other emerging markets, redefining the ancient trade routes that once linked East and West. When King Abdullah bin Saud, the current ruler of Saudi Arabia, came to power in August 2005, he wasted little time in demonstrating his vision for the country’s future. His first official overseas visit, in January 2006, was not to U.S. president George W. Bush, U.K. prime minister Tony Blair, or German chancellor Angela Merkel — but to Chinese president Hu Jintao. The meeting reflected both countries’ desire to forge closer economic ties. Before King Abdullah went on to other emerging markets, including India, Malaysia, and Pakistan, he and President Hu signed an agreement of cooperation in oil, natural gas, and minerals. This agreement built on existing relationships between the countries’ national energy companies, Saudi Aramco and Sinopec, which had formed a partnership in 2005 to construct a US$5 billion oil refinery in eastern China’s Fujian province. In 2011, they signed a memorandum of understanding to build a refinery in Yanbu, on the west coast of Saudi Arabia. Sinopec is also engaged in a joint venture with Saudi Arabia’s petrochemicals giant SABIC; in 2010, they began producing various petrochemical products in a $3 billion complex in the city of Tianjin in northeast China, and have recently announced that they will build a $1 billion–plus facility there to produce plastics. The rise of emerging markets in the global economy has sparked a great deal of discussion, particularly in the wake of the worldwide financial crisis. The implications are often framed in terms of the potential impact on the economies of the U.S. and Europe — for instance, business leaders discuss whether emerging nations’ consumers might be interested in purchasing American products, or whether European telecom operators can counter stagnation in their own markets by investing in new mobile networks in Asia. But a closer look reveals a separate trend that could shift the economic focus away from the West. Emerging markets are building deep, well-traveled networks among themselves in a way that harks back to the original “silk road,” the network of trade routes between East Asia, the Middle East, and southern Europe, some dating to prehistoric times and others to the reign of Alexander the Great. Most of these routes were central to world commerce until about 1400 AD, when European ships began to dominate international trade. Today’s new web of world trade is broader and more diverse than the old silk road. It is a network among emerging markets all over the world, including China, the Middle East, Latin America, and Africa. It is a path not just for expanded trade in goods, but for short-term and long-term investment and the transfer of technological and managerial innovation in all directions. Witness, for example, China’s investments in Africa, where the construction of roads, railways, and communications infrastructure provides revenue to China’s state-owned enterprises and also facilitates China’s access to the continent’s natural resources and its consumers. Or consider the fact that in 2009, China surpassed the U.S. to become Brazil’s primary trading partner; bilateral trade between the two countries grew more than 600 percent between 2003 and 2010, from $8 billion to $56 billion. Also in 2009, the Korea Electric Power Corporation, a state-owned South Korean firm, won a $40 billion contract to build nuclear reactors in the United Arab Emirates (UAE), beating out French and U.S. companies that had bid on the opportunity. And in 2010, Russia and Qatar announced that they would work together to develop gas fields on Russia’s Yamal Peninsula. Such developments remain largely separate activities in the global economy, but taken together, they are early evidence of a pattern that public-sector and private-sector leaders in every part of the world should take into consideration. The countries of the Gulf Cooperation Council (GCC) — Bahrain, Kuwait, Oman, Qatar, Saudi Arabia, and the UAE — represent one regional powerhouse whose relationships with emerging peers can offer valuable insights into the way such alliances are forming. In the last five years, ties between the GCC and the BRIC countries (Brazil, Russia, India, and China) as well as the “Next 11” countries (Bangladesh, Egypt, Indonesia, Iran, Mexico, Nigeria, Pakistan, the Philippines, South Korea, Turkey, and Vietnam) have expanded strongly. (See map.) The speed with which the new silk road is being constructed between the GCC and these other rapidly emerging economies is a clear indicator of the GCC’s rising importance. Even the recent unrest in the Middle East, which included a few of the GCC nations, has not impeded the Gulf’s global ambitions. The GCC is also noteworthy because of its traditionally strong relationships with the U.S. and Europe. The Gulf nations have to maintain their relationships with these large but relatively stable economies while fostering new relationships with the high-growth economies in emerging markets. This balancing act could lead to a new set of policies and ambitions in the region, with significant implications for companies that hope to enter this market, and for the nations (which include the U.S., China, Japan, and most of Europe) that compete for the GCC’s oil and gas resources and have a vested interest in ensuring that regional security issues do not destabilize global oil prices. By analyzing the dynamics behind the growth of the GCC’s alliances with other emerging countries, GCC leaders can see where there could be potholes in the new silk road and what reforms will be necessary to avoid them. At the same time, the companies and governments of Europe and the U.S. can develop a better understanding of what they will need to do to ensure that their own opportunities in the GCC are not lost in the years to come. The primary drivers of the relationships between the GCC and the BRICs and Next 11 countries are trade, people, and capital; equally important, though more difficult to track with data, is the exchange of knowledge and technology. 1. More than oil. The top item on the strategic agenda for every GCC country is to diversify its economy and thus decrease its dependence on oil. Despite significant efforts, achieving this goal has so far proven challenging: Oil and gas accounted for 38 percent of GDP in the GCC in 2000, 42 percent in 2005, and 39 percent in 2010. The governments in the region are eager to continue investing their oil revenues in knowledge-intensive industries that will create jobs for local populations, and they will cultivate trade partners that help them. This is one major reason that 19.4 percent of the GCC’s trade flows now involve the BRIC countries, compared with just 8.9 percent involving NAFTA countries. And GCC trade flows with BRIC countries are also more diverse than those with the United States. For example, Saudi Arabia’s exports to the U.S. still revolve around oil, whereas its exports to BRIC countries include chemicals, plastics, and minerals. The UAE’s exports to China, similarly, are split among a range of products, led by plastics (28 percent), electronic equipment (15 percent), and vehicles (9 percent). The GCC’s non-oil exports to the Next 11 countries are also on the rise. Such exports (including chemicals, plastics, and aluminum) from the GCC to Vietnam, Indonesia, and Turkey are still quite small in absolute terms, just $11.6 billion in 2008. However, they increased by 389 percent between 2001 and 2008, an indication of things to come. In future years, GCC companies will be looking to expand in a number of directions that will affect their exports. They will build manufacturing bases, as well as act as importers and resellers for automobiles and other advanced manufacturing products; they will also continue developing expertise in critical areas such as water desalination and complex infrastructure and construction projects, and may begin looking outside the region for destinations for those services. Trade partners that support the GCC’s economic goals will find themselves in favorable positions. 2. Rich in talent. As goods and services flow across the borders of the GCC and other emerging markets, so do people. Air arrivals in the GCC from China more than tripled between 2005 and 2009; arrivals from India, which historically has had deep ties to the GCC, increased by 35 percent. Arrivals from Turkey, Egypt, Indonesia, Pakistan, and Iran are on the rise as well: The GCC saw 2.2 million visitors arrive from Egypt in 2009, compared with 1 million in 2005. During the same period, the number of visitors from Pakistan increased from 769,000 to 1.4 million. The most significant aspect of this change is the skill level of many of the people entering the GCC. No longer do executives come from the West and laborers from the East; instead, skilled individuals from emerging markets are deepening their impact in the GCC with influential positions in the region’s financial, energy, transportation, and public sectors. India, in particular, has a large community of professional expats in the region, stretching back several decades. Because GCC countries do not publish data on the types of jobs that expats come to the GCC to perform, this trend is difficult to quantify; we are discussing it here primarily on the basis of our own extensive experience and observations. One indicator of the size and status of the Asian expat population, though, is the fact that this group’s private wealth (for which data is available) is now equal to or greater than private wealth among Western expats, and private wealth among Arab expats from outside the GCC is rapidly catching up. In Saudi Arabia, for example, Asian expats held $46 billion in private wealth in 2009, compared with $41 billion for Western expats and $21 billion for Arab expats. In the UAE, Asian expats also led the pack at $27 billion, followed by $20 billion for Western expats and $17 billion for Arab expats. As countries that are poor in resources but rich in talent send their people to the GCC, they not only further the GCC’s own growth aspirations; they also put their expats in a strong position to encourage and maintain the GCC’s relationships with their countries of origin. 3. New sources of capital. GCC nations have long been investors in other countries — primarily in the U.S. and Europe — via their sovereign wealth funds and other state-owned entities. Although Western countries are still the primary recipients of GCC investments, accounting for 71 percent of capital outflow from the GCC between 2003 and 2008, they are slowly losing share to other Middle East countries and Asia. In light of the strong role that GCC governments play in determining the direction of their countries’ capital investments, this trend could accelerate if GCC governments decide that other emerging markets are a better strategic destination — both economically and politically — for their riyals, dirhams, and dinars. To some degree, of course, all governments play a role in their national economy. In the aftermath of the global financial crisis, most governments’ roles are larger than they used to be, thanks to bailouts of critical industries in Western countries. But major emerging economies such as China, Russia, Brazil, and Mexico, and the countries of the GCC, among others, are active proponents of “state capitalism” — defined most recently by political risk expert Ian Bremmer as a system in which governments direct state-owned companies, private companies, and sovereign wealth funds in ways that will maximize the state’s resources and power. (See “Surviving State Capitalism,” by Art Kleiner, s+b, Summer 2010.) These countries approach state capitalism not as a last resort in times of crisis but as a sensible policy for protecting national interests while still encouraging economic growth. For decades, the prevailing view in Western capitalist societies has been that this model cannot succeed — that the bureaucratic nature of government agencies could never compete against a nimble free market. And certainly, some state-owned enterprises in the GCC have stumbled, such as the real estate companies in Abu Dhabi and Dubai that required bailouts. In recent years, however, the track record of some state-supported sectors in the GCC shows that the issue is not quite so black and white. The state-owned airlines in the UAE and Qatar — Emirates, Etihad, and Qatar Airways — have quickly achieved global prominence. In fact, some European carriers (many of which used to be state-owned themselves) complain that it is unfair to have to compete against airlines with the power, and perhaps the economic support, of the state behind them. Thanks to strategic global investments, the size of the GCC’s sovereign wealth funds has nearly tripled in the last decade; they now hold approximately $1.1 trillion, compared with just $321 billion in 2000. And the GCC’s oil companies — the original source of the region’s wealth — are renegotiating their contracts with the foreign oil companies operating within the countries’ borders in ways that give them greater control over national resources while still allowing them to exploit the foreign oil companies’ technology and expertise. 4. Getting connected. As GCC countries seek to branch out and build relationships with other emerging markets, they have found one point of entry in the information and communications technology (ICT) sector. Like many other developing nations, they have recognized the importance of building knowledge economies to accelerate their development, and have made infrastructure investments and policy changes accordingly. Their rankings on the World Economic Forum’s Networked Readiness Index, which measures “the degree of preparation of a nation or community to participate in and benefit from ICT developments,” reflect their efforts: The UAE moved from number 28 on the list in 2005 to number 24 in 2010 (out of 138 nations on the list that year); Qatar jumped from number 40 to number 25 during the same period; and Saudi Arabia, which made its debut on the list in 2007, improved from number 48 in that year to number 33 in 2010. In making these advances, GCC countries have frequently looked to their counterparts among other emerging nations, many of which have similar initiatives under way. As a result, the nations of the Gulf and their partners in other emerging markets have collaborated to boost their ICT development in ways that they might not have been able to do alone. Shared infrastructure, for instance, has been crucial. The new silk road runs underwater, in the form of submarine cables that connect the GCC to countries including India, Thailand, Malaysia, South Korea, Pakistan, South Africa, Nigeria, and Sri Lanka. Chinese companies Huawei and ZTE have provided equipment for GCC telecom networks; Huawei has even gone beyond infrastructure to invest in talent in the GCC, sponsoring an academic chair in information technology and communication at the UAE’s Higher Colleges of Technology. Telecom operators, too, are looking to emerging markets to drive their business. Since the GCC deregulated its own national telecom markets in the 1990s, local operators have been on an acquisition spree, expanding their international footprint from 28 markets in 2005 to 44 markets today. These new outposts are mostly in emerging markets, spanning Indonesia, South Africa, South Asia, the Middle East and North Africa region, and sub-Saharan Africa. These investments run the other way, too, as companies like India’s Bharti consider investments in the GCC. For emerging markets to play any significant role in the global economy of the 21st century, they will need to invest in ICT infrastructure and talent. Pooling their resources to do so can advance them more effectively. The bonds between the GCC countries and the BRIC and Next 11 nations are growing stronger — a development that Western countries to date have viewed with trepidation, fearing that a zero-sum game will leave them cut off from increasingly significant consumer markets and sources of natural resources, goods, and services. But in an interconnected world, unexploited opportunities await players all over the globe. The fact that these emerging alliances are still in their infancy means that companies and governments in the U.S. and Europe can act now to formulate a response. In doing so, they will need to recognize that the weakening of their own economies during the financial crisis has undermined their historical advantages in the GCC region and has enhanced the appeal of fast-rising emerging markets. To succeed, then, developed economies will need to capitalize on the strengths that their emerging competitors cannot yet match. For example, the U.S. and Europe are still world leaders in terms of building the capabilities and infrastructure that are crucial for innovation, and they have a history of helping GCC countries develop these assets as well. Many of the region’s oil companies relied heavily on contributions from their international partners in their early years, exchanging access to oil resources for foreign talent and technology. This trend continues today: For instance, King Fahd University of Petroleum and Minerals in Dhahran, Saudi Arabia, has formed a partnership with U.S.-based Cisco Systems to create a regional Cisco Networking Academy, which is intended to ensure that the university’s students are prepared to succeed in the digital economy. Companies in developed countries can also build on their extensive global supply chains to easily integrate new partners — whether as suppliers or as customers. For their part, as the nations of the GCC look around the world to develop their network of relationships, they will find many opportunities with partners in both developed and developing nations. In order for these relationships to have the greatest impact in the GCC, the Gulf nations must seek the investors and trade partners that can help them address their pressing priorities: the creation of new jobs, competition that will spur their own national champions to greater success, and investment in their physical and educational infrastructure. Gulf nations have begun building these relationships already, and in doing so their economies have become much less insulated than they were in the 1970s and 1980s. However, to increase their appeal to international partners, GCC countries will need to continue making progress on the internal reforms that are under way. Of the six nations in the GCC, only Saudi Arabia ranks in the top 20 countries in the 2010 World Bank Doing Business report, at number 11; Bahrain comes in at number 28, the UAE at number 40, and Qatar at number 50. They need to reduce the amount of red tape required to start or invest in a business, provide more transparency in business fundamentals, and invite more private-sector investment in industries that still have substantial government involvement. They should also expand their overall talent base by making it more appealing for foreigners who have critical skills to live in the region, while simultaneously developing their own people and ensuring that they have the right capabilities to build critical sectors such as energy, education, and communications. GCC countries will also need to keep pushing forward on economic integration within the region, which will bolster their presence on the world stage. The countries of the GCC have much more clout as an economic bloc than as six separate entities, and they must continue to implement policies that reflect this perspective. A recent Booz & Company study assessed the progress of the GCC toward regional integration on a number of measures using a scale of 1 to 5, with 1 indicating “major setback to the goal” and 5 representing “accomplishment or near completion of the goal.” When all measures were taken into account, the study found that the GCC had achieved an overall score of just 2.9 out of 5. The Gulf nations must redouble efforts toward the creation of a monetary union, improve the coordination of customs and border policy, promote greater intra-regional investment, fulfill joint infrastructure commitments, and increase collective efforts in research and development. If the GCC can become a stronger economic bloc, the entire region will become a less risky, more attractive proposition for investment. The GCC is at a critical juncture as it determines the parameters of its relationships with partners both old and new, Western and Eastern. But there’s no doubt that the new silk road can be a path toward future prosperity for the GCC countries, building trade and creating wealth as powerfully in the 21st century as the old silk road did in ages past. Joe Saddi is the chairman of the board of directors of Booz & Company and the managing director of the firm’s business in the Middle East. His work covers multifunctional assignments in the oil, gas, mining, water, steel, automotive, consumer goods, and petrochemical sectors. Karim Sabbagh is a Booz & Company senior partner based in Dubai. He leads the firm’s work for global communications, media, and technology clients. He is a member of the firm’s Marketing Advisory Council and the chairman of the Ideation Center, the firm’s think tank in the Middle East. Also contributing to this article were Booz & Company principal Mazen Ramsay Najjar, Ideation Center director Hatem A. Samman, and s+b contributing editor Melissa Master Cavanaugh. Ian Bremmer, The End of the Free Market: Who Wins the War Between States and Corporations? (Portfolio, 2010): The potential power of state capitalism. 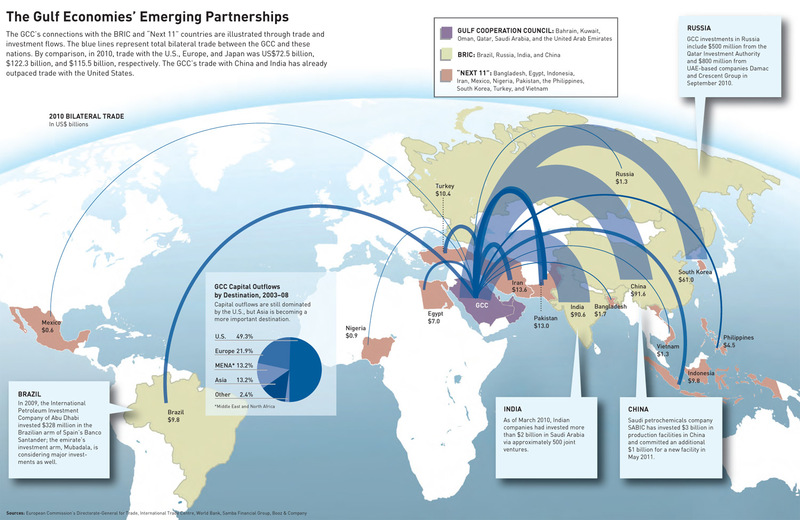 Economist Intelligence Unit, “GCC Trade and Investment Flows: The Emerging-Market Surge,” 2011: Presents research on the strengthening economic ties between the GCC and other emerging markets. Gideon Rachman, Zero-Sum Future: American Power in an Age of Anxiety (Simon & Schuster, 2011): A zero-sum approach to global economics, in which one country’s gain is another country’s loss, is undermining attempts to restart the world’s growth engines after the recession. Joe Saddi, Karim Sabbagh, and Richard Shediac, “The Challenges of Balance,” s+b, Summer 2009: Analysis of the difficulties confronting the GCC’s rapid economic growth.